Aside the post-steamship route Rhodes-Smyrna, about 80 km to the west of the city of Rhodes lies the isle of Telos today Tilos or in Italian, Piscopi, lonely and isolated in the blue waters of the Aegean Sea. No mailboat, no trading vessel ever drops anchor and even connections via yachts to Symi or Rhodes are poor, and only used for vital needs. The island itself is very mountainous and as most of the Aegean islands, barren. It has a kind of bleakness which brings, in the long run, despair to the nature loving traveller in this area. Daily, one searches for the island of ancient times, with its rich forests it must have been a true paradise, but what is it today? A bleak island, a barren coast, showing its ever growing state of neglect and eastern indolence. One larger and one smaller valley alone offer opportunities and possibilities to till the soil. Otherwise mountain slopes and hillsides are barren and only in spring populated by herds of mountain goats whose goatherd spends his time with a reed pipe. This reed pipe, made from differently sized hollow reeds kept together by a piece of wood, has the form of those of classic antiquity still called today - Pan Pipes. Those two valleys give evidence of intensive cultivation, even the smallest usable space was not forgotten. Barley, figs, almonds, and nuts are now the main cultivated products. Also cultivated are olives, apricots, and peaches. Barley and olives are for their own use (for bread and oil), while almonds and nuts are exported. Every year Jewish traders buy up the harvested almonds and nuts at ridiculously low prices. Effort and labour stay with the poor and hard-working people of Telos while the profit stays with the Spanish Jews from Rhodes. The population of the island is entirely Greek except for the ‘Memour’ (a minor Turkish government official), who is most likely the only Muslim on the whole island. The population is less than 1,000. As habitations there is only the little village Telos in the north-west and an even smaller hamlet in the west of the island. The village called Telos is about 20 minutes from the sea, on the mountainside overlooking the fertile valley. It is poor in appearance, all the buildings have flat eastern style roofs. The streets are so narrow that one can easily walk from roof to roof by bridging them with a plank. If one were on a roof and wanted to visit a neighbour on a roof across the road, one simply put a plank to the neighbour’s roof and so saved using the stairs twice. Behind the village the rock face climbs near vertically, to a lonely mountain crest whose narrow summit is crowned with the remains of a Genoan fort. Because the food production capability of Telos is not enough to nourish the whole population, a big part of the male population leaves for the nearby Anatolian coastline each spring, to earn meagre livings as agricultural labourers. In autumn when the harvest has been brought in, these men return home to spend the wintertime with their own people. Some of the female population also follow the male example. Often you may find women from Telos on the neighbouring bigger islands of Symi and Rhodes, working as day labourers, doing all kinds of jobs. Being isolated has helped to preserve, in a wonderful way, their traditional costumes and way of living. Today it is still as it was 100 or more years ago. All men wear the simple costume of the Greek islands which does not stand out in any way, but unfortunately the jacket (à la française) is already beginning to supersede the short embroidered eastern jacket. Regrettably, I saw already one of those Franconian jackets on Telos. old and young holding onto the tradition. The mentality of the women in our society, welcome the change of fashion as something highly refreshing. Yet the women of Telos guard the traditional costumes, which they wear from the age of four and in which they are buried. 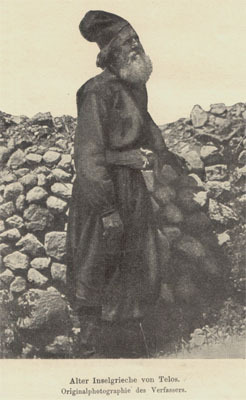 Less appealing and attractive are the working clothes of Telos women, long boots and gowns in a dark brown colour, reaching to the knees and with a hood protecting against the heat or cold. On Sundays and during the many festivals, they wear completely different costumes. The unattractive dark brown garment is replaced by an extraordinary decorative and appealing costume. One would think that overnight these unattractive brown cocoons have transformed themselves into beautiful butterflies. The long boots worn on Sundays have sturdy soles, with low heels and the uppers are made from soft light yellow coloured leather (Crete style). The basic colour of the costume is white, the fabric is linen or cotton; it consists of a simple white pleated skirt reaching to the knee, under which the white petticoat is seen. In contrast to the very simple skirt, the petticoat has a braided rich dark red border decorated with colourful embroidery. The upper part of the costume is of the same white fabric as the skirt, with white sleeves reaching to the wrist where the cuff is finished in dark red embroidery. The top fitting close to the throat, the chest area features an inserted panel of embroidery mainly in black red and green. This area of the garment is used to display necklace chains decorated with gold medallions, coins, colourful glass and amber items. The back of this upper garment has a similar panel reaching halfway down the back in a light coloured silk, this panel is ‘framed’ with bands of embroidery about two to three fingers wide. The same dark red embroidery pattern is used on the neckline, wrists and petticoat hem. This simple yet attractive garment is finished with a dark red woollen belt wrapped several times around the waist. The extraordinary and original headdress is based on either dark red or brown stiffened plush material, shaped to form a peaked hat. Over the headdress is a scarf made of white material, richly and colourfully embroidered. The scarf is worn either loosely over the back or tied under the chin. The overall impression of this costume is pleasing to the eye, well co-ordinated and graciously feminine. This costume must be unique to Telos because I have not seen anything even similar on any of my travels in the neighbourhood or further afield. On festivals and often on Sundays the women of Telos gather at the church in the evening to perform the traditional dances with determination and perseverance until the early hours of the morning. The dancing area, right beside the church, is paved with pebble mosaic in beautiful patterns. The lighting for the dancing was provided by two large lanterns on tall poles (normally used for religious processions) on loan from the priest for the pleasure of the dancers. They dance in a circle, the 40 to 80 dancers holding hands so that the right hand of each dancer reaches across the chest to the dancer on the left. The left hand reaching across to the dancer on the right, and so on. Two to three men lead the dance. The musicians sit in the middle of the dancing area playing the simple music. Performing this dance for four hours without pause or alteration, must be a very odd pleasure! But the fact is that the female dancers enjoy it very much, their eyes show their pleasure. Undoubtedly the special attraction of this dance is not only the display of the costumes, but is also the impression on the spectators with the double movement of the circle – the right step component progresses the movement around and the half steps backward and forward creating regular and charming waves of expansion and contraction. After watching for a time, the long row of female dancers seem to hover just above the ground. It is highly entertaining to watch the precision of the dance steps, as none of these Cretan boots are ever out of step. Suddenly, the music stops, while the dancing continues at a slower pace and the singing starts. The singing has several styles; traditional, argumentative or topical, with opposite sides of the circle taking turns to respond or react, the refrain being sung by all the female dancers. As already mentioned, in the two small valleys every square inch is cultivated. For this reason they do not waste precious land on a Cemetery, instead they have made a few simple cavities in a wall, in which they place their dead. There they remain until there is no more space, when the family of the deceased is asked to remove the remains and store them at their home. On Telos it is the tradition that the eldest daughter inherits everything, nothing being left to any other children. Because of this custom it is usual that only the eldest daughter marries – in these eastern parts, marriage is more a matter of family business than of the heart. If, for example the eldest daughter has several sisters, then these sisters will either follow into the new household immediately or, they will stay with their parents until death of the parents. In either case they become ‘maids’ in the household of their older wealthier sister and also become available as secondary ‘wives’ of their brother-in-law. Every Sunday the church and monastery bells ring signifying the Christian opposition to this tradition, the priests and also the bishops try to discourage these practices. Even the Turkish government has tried. The Tillian people go regularly and devotedly to the church, - but the tradition survives! It must be understood that none of the FOTA members involved in this translation are professional translators. 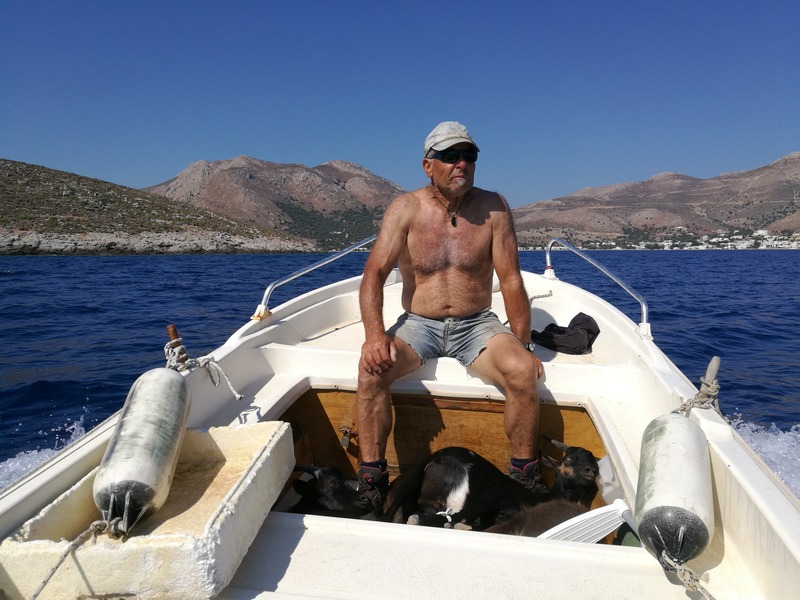 For all of us it has been a ‘labour of love’ – for Tilos. Ulrich Scherf, who has provided this publication containing this ‘visit report’, also re-typed the original German text. Regina and Jörg Köhler-Schoch used the text provided by Ulrich, to develop a realistic translation into English. Mike Davies and Joy, worked closely with Jörg & Regina to construct modern English terms and sentences so as to reflect, as far as possible, the apparent meaning of the original text. It was a strange feeling, on the last day of April 1999, to be sitting on the balcony of a modern apartment in Livadia (which does not get even a mention!) overlooking the Town and it’s brilliant Bay, wondering what Friedrich Vincenz would have thought about our laptop computer, the Internet and the small group of four people working at understanding his report - virtually 100 years later? We have retained the name of the island Telos, just as in the original text. It is interesting though, that the term ‘Tillians’ is used. We spent a lot of time trying to understand Friedrich’s description of how the women held hands with the adjacent dancers. 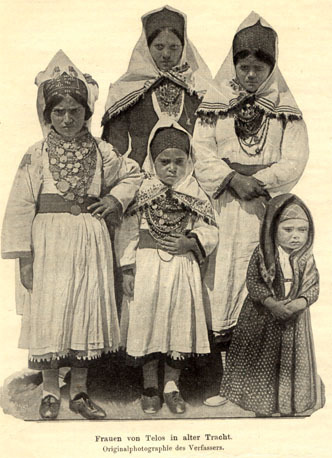 Consultations with local Tilos people in Livadia, produced the information that “Tillians have NEVER danced with their arms crossed in front of their own chests”. Whatever the truth of the matter, we decided to use the exact description give by Friedrich. Of course the possibility exists that Friedrich was mistaken; the light was poor, and he gives no information of the level of hospitality provided by his hosts! Clearly his walk back to his ‘Steamship’ was euphoric! Friedrich consistently uses the term ‘Oriental’ to describe Telos and its buildings. Since in todays English this term currently refers to the far east like China and Japan, we have chosen the less confusing (hopefuly) term ‘Eastern’.